Combat Vehicles Research and Development Establishment (CVRDE), Avadi, will design and develop gearboxes for India's advanced medium combat aircraft. 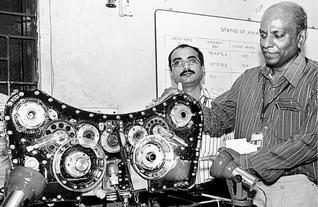 At a press conference, CVRDE director P. Sivakumar said the Aeronautical Development Agency (ADA) has promised the new project after the Aircraft Mounted Accessory Gearbox (AMAGB), used in Light Combat Aircraft (LCA-Tejas), was approved by the Centre for Military Airworthiness and Certification (CEMILAC). CVRDE, Avadi, had indigenously designed and developed AMAGB for LCA – Tejas and till date these gearboxes have undergone more than 2200 hours of flight testing with 1465 flights. CEMILAC ‘type approval' certification was mandatory for induction into the Indian Air Force, he said. “AMAGB is a very critical line replacement unit for the LCA and forms a very important part of secondary power system. It is a light weight (40 kg), compact, high speed, single input, multi-output gearbox with a maximum power transmission capability of 185 kW at a rated speed of 16,810 rpm,” Mr. Sivakumar said. The castings are made of magnesium alloy and the gearbox has its own self-contained lubrication system. AMAGB operates in two modes. In the starter mode, it aids in starting the engine through jet fuel starter. In accessory mode, it drives two hydraulic pumps and an integrated drive generator. These accessories, in turn, generate hydraulic and electrical power for the aircraft, said C. Chandrasekaran, additional director, CVRDE. S. Ganesan, head, aircraft division, CVRDE, said the AMAGB gearbox had undergone strenuous environment tests, altitude tests, shock test, vibration and other necessary tests. The gearbox has undergone 1000 hours of endurance test, he said. Apart from design and development of manned and unmanned ground vehicles, CVRDE was also developing products to the demands of Indian Air Force and Indian Navy, Mr. Sivakumar said.